In the past, I tried my best to answer this question using simple explanation. I have burned my hands in past saying, I do “Computational Fluid Dynamics”. People just say “hmmm... looks like you are doing something really good with your life”. In reality, I never made honest efforts to explain them what I do. 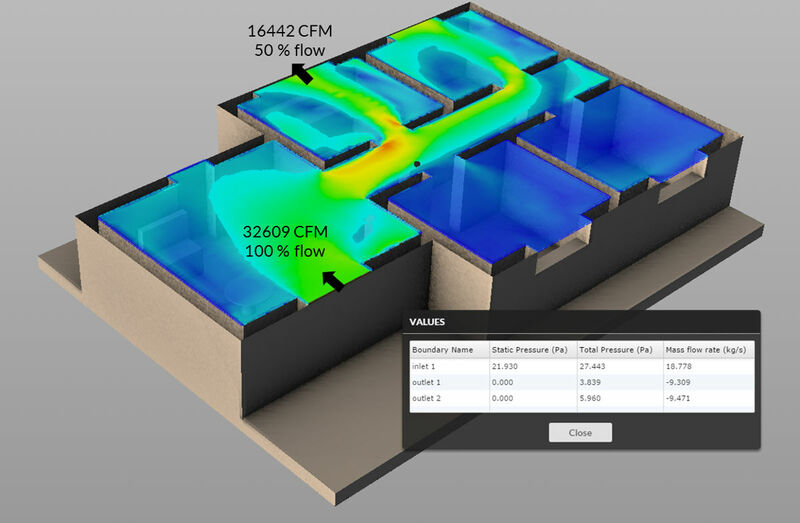 Sometimes, I tried to see around and find an application where CFD can be used. Many times I had used example of a fan, a fridge and said that “We help the companies to improve design of such equipment’s”. Most of the time, they say “ooh... So you are also making ceiling fans! !” I ended up saying not exactly, but sort of. This week I was super high on launch of our new product simulationHub and I had leisure of time. In our board discussion, we always emphasized how we want to build a simulation software which would solve people's day-to-day life problems. And so, I decided this year, I would try to explain them by practical example. 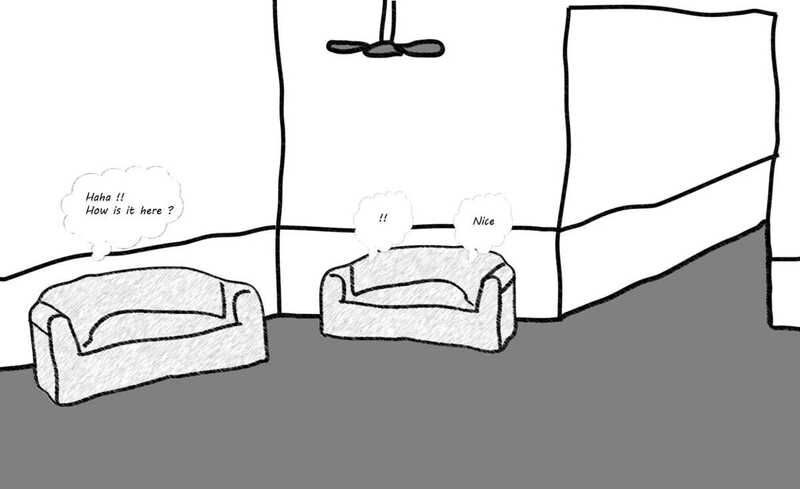 Fortunately, because it helped me at this moment, we were sitting on the sofa located at the corner of a living room. There was a ceiling fan running in the living room making this conversation comfortable in November heat. So as such, we were comfortable for the next few hours to continue our conversation. I saw my aunt cooking something for all of us inside the kitchen. I believe she was not comfortable working in the kitchen with extra heat. She was happy to have all of us visiting for Diwali but extra heat and high November temperature was not ideal working conditions for her. There was no ceiling fan in the kitchen, and cooking the food was adding some extra toppings on it. I also noticed although there was big window open in the kitchen, there was very little circulation of air. So I looked around inside and outside the house. The house had nice surrounding, lot of trees and good wind conditions. I thought, why they have not used the natural wind for better air circulation inside the kitchen. Natural air is free after all (Please do not ask why I am saying the wind is free. We might have to start different discussion.) Probably my relative’s understanding was, just by keeping the kitchen window open, there would be a sufficient air circulation. I think they have not thought through that other windows and doors play a vital role in natural air circulating inside the house. I found following was the configuration for their home at that moment. Front and back door of living room were open, the kitchen window was open and one of the adjacent room window was also open. Being an aerodynamicist and CFD is my field of work, I was able understand that fluid always gives preference to path of minimum resistance. So, no matter how many openings are there in a house, air will always choose the path of minimum resistance and rest of the areas will always lack the fresh air supply. In this situation, I had to make sure that the air path through the kitchen is the path of minimum resistance or it is only path available. In my mind I decided to solve this problem and to demonstrate that I do something worthwhile in my life. I had my companion laptop with 4G internet connection, ready to take any challenge. I was all set to solve this problem. I started looking around. The house was single storey bungalow. I was sitting in the living area. There were three other rooms and the kitchen. The bungalow had a big windows and looks like the orientation of house was such that few of the windows and sitting area entry door is directly facing the wind. Kitchen window was exactly opposite the wind direction (and that’s typically what you will see in most of the houses). This was my guess after feeling the wind flow, but later I confirmed it with weather data at that place. 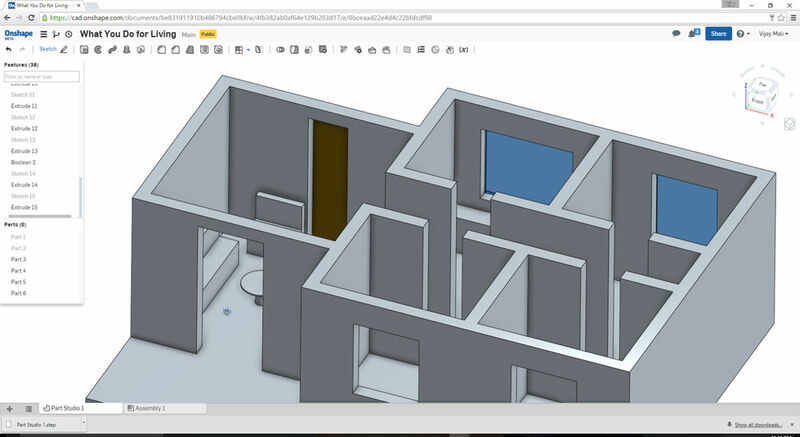 I created a rough sketch of house layout and created a 3D CAD model without much of inside details. I wanted a solution to be quick and without much of error in the data I was looking for. 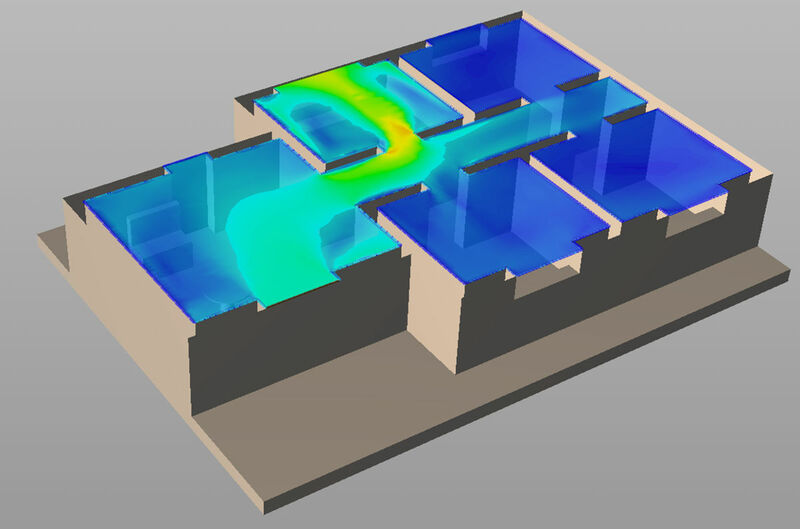 I was looking for major flow behavior inside the house. So I just included external and internal walls, door and window openings. Thanks to Onshape for providing full-cloud 3D CAD system. I was able to construct the CAD model within minutes. I then searched for the wind data for that location. I quickly got the wind velocity and direction from http://www.accuweather.com (which was approximately 3 m/s). Thanks to internet for making our life so easy and exciting!! By looking at sun, I deduced that the main sitting area door was directly facing the wind. So I was all set in terms of the CAD model of house and wind conditions. Now it was a time for me to solve the real puzzle. 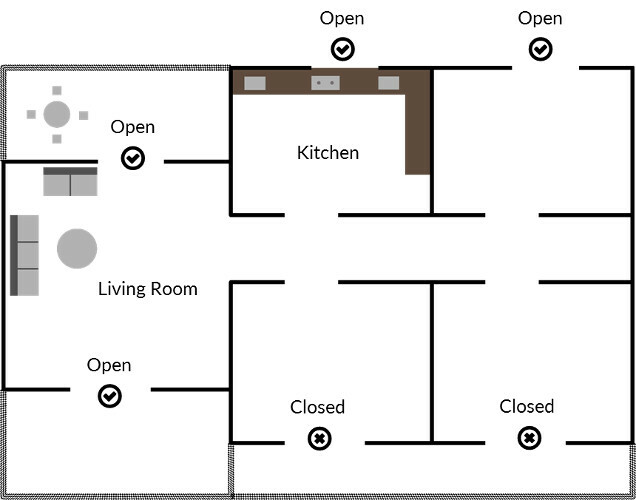 Which windows/doors should I open/close so that the cool fresh wind air will reach to my aunt preparing lunch for us in the kitchen? 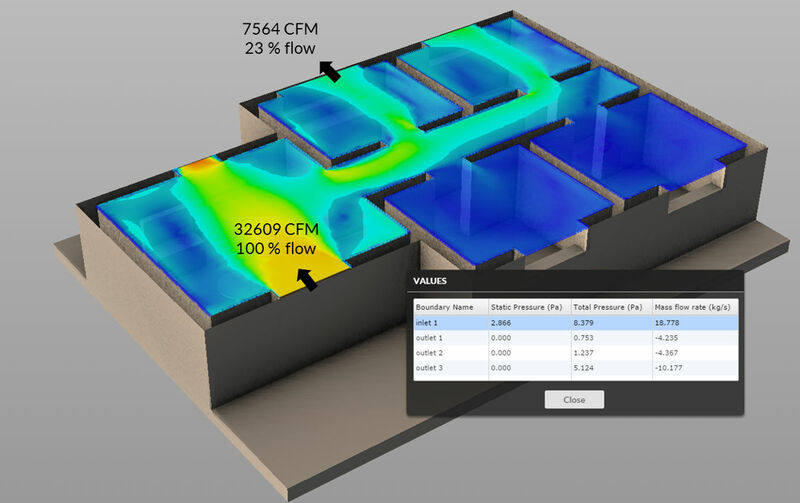 I felt really comfortable to answer this question as CFD is a bread and butter for me and I had a power of cloud-based CFD – simulationHub, waiting for me to ask this question. First, I wanted to know how the air circulation looks like in the current condition. Once I understand that, I will be in a position to find the way to get air in the kitchen. 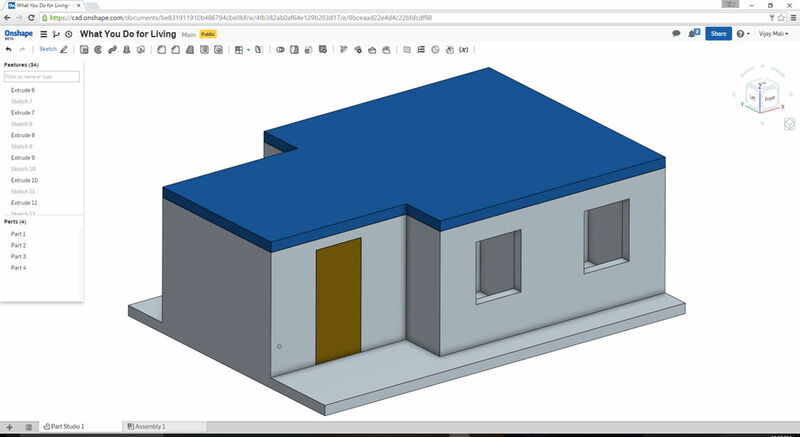 I logged into simulationHub.com and uploaded CAD model I prepared before on Onshape. Extracted the fluid domain. In the first simulation, I kept sitting area doors open, kitchen window open and another room window open. This was the present situation in the house. This is what I got from the simulation. 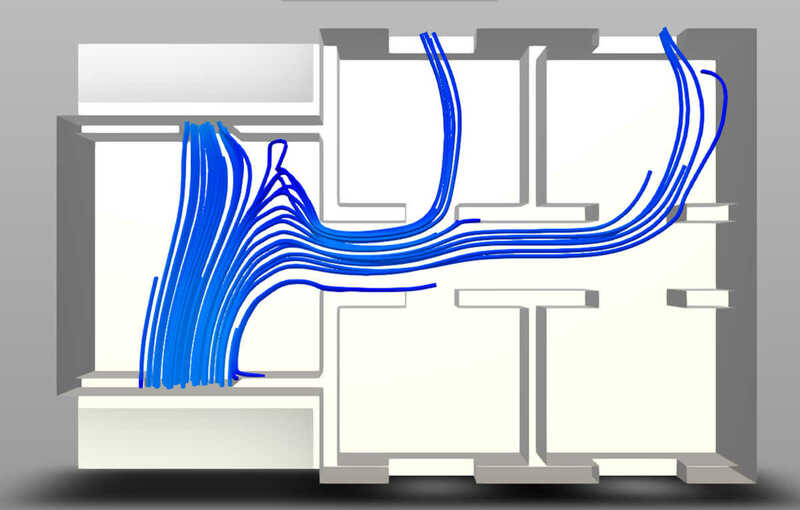 The results on this configuration showed that the majority of flow was going out of sitting area back door. The kitchen was getting only about 23 % flow. Based on the comfort condition of my aunt and due to excessive heat added because of cooking, this was not sufficient. So there was a need to somehow get more air flow into the kitchen. I noticed that people were in the kitchen preparing the food, in sitting area waiting for food, and in one more room adjacent to kitchen. The ceiling fan in sitting area was running and was ready to add extra energy to circulate the incoming air flow from the main door. So as such there was no need of keeping sitting area back door open. It was just taking the fresh incoming air directly out of the house. I thought, the best solution for this situation would be to close the sitting area door and make sure that all incoming air either goes to the kitchen or adjacent room. This is what simulationHub said for this question. So by closing the sitting area back door, the amount of air going to the kitchen is increased. Originally, it was just taking 4.367 kg/s (which is equivalent to 7564 CFM) and after closing the sitting area back door, it is increased to 9.471 kg/s (which is equivalent to 16442 CFM). So that’s about 2.17 times increase in the free fresh air in the kitchen. I am not sure if I should say this, but that’s about two times more fresh air and comfort for my aunt in the kitchen!! In the end, my aunt asked if I can give her the combinations of doors and windows to be kept open or close if I am in some other room. I said, “Sure, but why don’t you give a try to those combinations on your own?” I shared all these file links with them. And that’s our vision - "Transforming human life by democratization of technology".